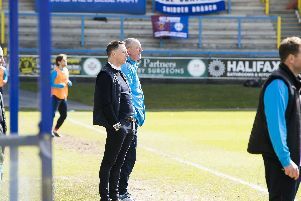 Town boss Billy Heath says Salford pushed his side all the way in their dramatic play-off semi-final second-leg at The Shay, which The Shaymen eventually won 3-0 on penalties. Richard Peniket handed Town the lead in extra-time before Michael Nottingham equalised to push the game to penalties, with Salford missing all their spot-kicks before Matty Brown converted the winning kick. “It was a really tough game,” Heath said. “Two evenly-matched sides who both can be physical, both put people under pressure and both have good set-pieces. “I thought it was a really good game. We got the goal and you think that will be enough, but credit to Salford for the way they came back and put us under pressure. “They knew they would ask questions and they got the goal. Then we go to penalties and we hold our nerve. “I’m so pleased it was at the end all our supporters were in. “There weren’t many clear cut chances but both teams in certain situations could have done better. “I thought we shaded it. We had the better of the chances but it was a very tight game. All credit to Salford, they were fantastic before, during and after the game. Heath was frustrated at the manner of Salfrd’s goal, which came just over 10 minutes from the end of extra-time. He said: “We’re disappointed to concede the goal. We’ll pick the bones out of it but it was a poor one to concede because it’s from a quick throw-in, and we weren’t set up right. “We talked about that in the interval to make sure we get in positions quickly because we’re tired. Brown has suffered an injury-plagued season, but has recovered to now be part of Heath’s first choice back four. “I thought he was outstanding,” said the Town boss. “We played him against Chorley and then we wanted to see how he would go because he’d been out for a big period again. But he was magnificent and he kept his place. But it’s his character. When you go into a penalty shoot-out you need people with strong minds and strong wills, and Matty Brown certainly has that. “He’s had to have that strength of character to come back from the injuries he’s had, because he desperately wants to play. When asked what his final words to his players were before their penalty shoot-out, Heath replied: “Hit the target. The worst thing you can do in a penalty shoot-out is miss the target. Whether the keeper saves it, whether you go down the middle or have the confidence to go for the corners. All I said is just hit the target because it’s the worst thing in the world is to take a penalty and you miss the target because you shouldn’t miss the target from 12 yards.